I booked this online after some research and when we arrived the hotel staff struggled to find our booking as their computer system had crashed, it was still in the same state when we checked out two days later! This was also the excuse given for the room not being made up until we asked at 5pm. The shower was hand held only and you had to step into a high spa bath to use it, slightly dangerous to say the least! The bed was about 50cms off the floor and the room was in the roof space so the dormer window setback meant that heads were bumped frequently. We stayed in one of the superior rooms. The view is great. The rooms are really outdated and ours was even not cleaned that well. In addition the bathroom had an unpleasant smell. Don’t think we’re coming back again despite the fabulous location. We werde with a group there. It looks like in the 80. Breakfast is good with good joice - but the Coffee was terrible for me. Familyfriendly because we could get an extra bed. for our daughter. Dinner is Served as buffet. I do not recommend this place, lousy service. Me and my partner spent one night there, we booked through the internet. We arrived at the hotel and the receptionist seemed angry and was very little polite. The rooms were terribly hot and there were neither fans nor air conditioners available. The rooms were very different from the pictures we had seen in advance. The only thing that was positive, was the distance to shops and cultural experiences. We stayed here for 3 nights on our 4th leg of the Scandinavia and Baltic countries. We came in from Helsinki on the Viking Line. The hotel is located a short distance from the harbor. It is walkable, but with luggage and a young child, we chose a taxi which was 8 euros and paid 5 euros on our way out to the same harbor. Not certain why there was a difference in price except the 5 euros used a meter and the other one just gave us a flat rate. Something to be aware of! The hotel is right in the “Old Town”, very convenient and walkable to most attractions. I’m guessing there are at least 10 museums in the Old Town alone, from the Torture Museum to several medieval types. The Metro to Kadriorg Park, Kumu Art Museum etc is close by and you can take bus # 73 from the same stop area to the Maritime Museum, St. Olaf’s Church etc. Location wise, you can’t go wrong. The room was clean when we checked in, but housekeeping on the other days can use some improvement. The biggest issue we had with the hotel was the noise level. There is no air conditioning as common in all these European hotels (a real shame). So, we had to leave the window open, most nights. The noise was on all night! 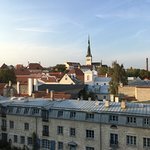 Do folks even sleep in Tallinn? And, it didn’t help that there was really no darkness at all! Crazy, so it sounded like there was a party going on all night. We stayed in room 208, which opened up to the courtyard. The other issue was that the curtains didn’t blockout the sunlight. Other than that, our stay was pleasant.